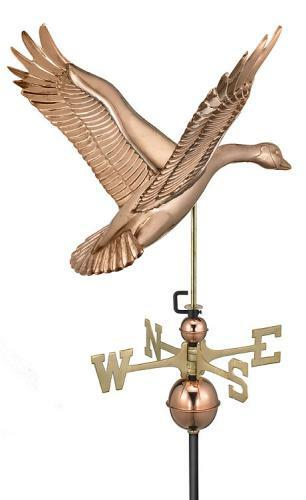 Copper Goose Weathervane. Measures 20" L x23" H x 29" Wingspan. This goose is captured in mid-flight to grace the rooftop of your house, barn, garage, or cupola. Old World techniques are used to handcraft this fully functional, standard-size weathervane that's unsurpassed in style, quality and durability. A great gift for wildlife enthusiasts! Dimensions:Measures 20" L x23" H x 29" Wingspan. Note: Measurements are for figure only - Add an additional 32" to the overall height to accommodate the spacer balls, directionals and rod.